Whether you're looking for streamers, table centerpieces, invitations or a piñata, you'll find what you need at one of the country's many party supply stores. While it is possible to purchase party supplies from your local Wal-Mart, K-Mart or Target, visiting a store that specializes in helping customers plan their celebrations ensures a larger selection of merchandise. Although there are many party supply stores scattered across the United States, these offer great selections with additional perks. For discount party supplies, there's no better place to shop than Party City. This discount party superstore carries everything you need to throw a fun celebration for your family and friends! 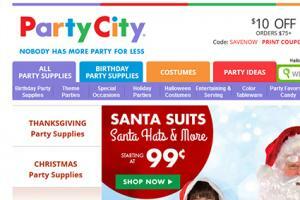 Party City has over 800 store locations across the United States. At Party City, you can purchase supplies for your son's first birthday, best friend's bachelorette party, and your parent's golden wedding anniversary in one convenient location. Of course, Party City also carries a selection of stationary, gift wrap, and cake decorating supplies to help you set the mood for nearly any type of celebration. Shindigz stands out from other party retailers by providing large-scale decorations and banners for the most popular themes and occasions. The site and catalog offer everything from three-dimensional scene setters to hanging/wall decorations, party favors, and costume pieces. If you prefer to browse their selection offline, you can request a catalog. 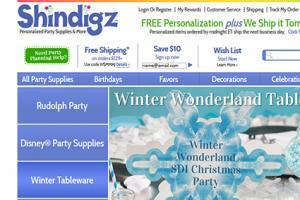 Shindigz also offers one of the biggest lines of personalized party supplies. From banners, yard signs, and favors to invitations, napkins, and tableware, you can personalize with names, dates, and event titles. Shindigz also offers the Shindigz Rewardz program for frequent party throwers, earning them 5% cash back to put towards future purchases, along with information about future deals and sales information. 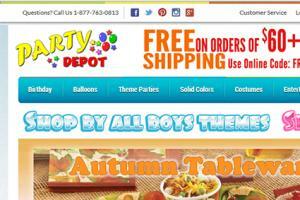 Party Depot is a family-owned and operated discount party store. Its founding was in 1994. Its locations are spread throughout the Northern Virginia area. It's a great option if you want to support a family-owned store but still order supplies over the Internet. Although family owned and with just a few physical locations, it still offers online ordering and shipping straight to your door. In addition to adult and child birthday party supplies, baby shower supplies, and bridal shower supplies, Party Depot also offers more than 1,000 costume options for children and adults of all ages. When you need inexpensive party supplies, favors, and party activities/games in bulk, Oriental Trading is the place to go. The party supply company does not have physical locations, but it ships directly to your front door. 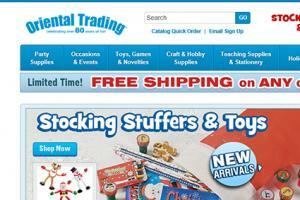 In addition to the website, the company also has a catalog for shoppers to peruse and order. You can find everything you need for almost any occasion. From DIY photo booth props to party essentials, candy, and favors, Oriental Trading has it for birthdays ranging from baby's first to Grandpa's 100th. There is even an app for it! Oriental Trading has its own app for mobile phones, so you can shop on the go. 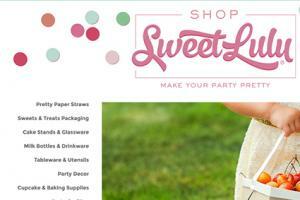 Sweet Lulu offers innovative party supplies that are hard to find anywhere else. From pretty paper straws in a myriad of designs and decorative ice cream cups to entire section of DIY party craft supplies, the mission of Sweet Lulu's owner is to "make a party pretty." You can shop by occasion, holiday, collection, or color. Sweet Lulu does not have any retail locations, so everything ships directly to your home or office. The store and website owner is not a party planner, but is a mom. She founded and named Sweet Lulu after one of her children, her daughter. The owner shops around for some of the most innovative, unique, and prettiest party supplies she can find and then offers them through Sweet Lulu. Her blog provides insight and suggestions on how to use some of the great party supplies you buy at Sweet Lulu. Have a list of items you need, including the quantities of each item. If you're serving a meal plus cake and ice cream, remember to allow two plates per guest. If you're on a budget, only bring as much money as you want to spend to the store or check your online cart frequently. This will help you avoid the temptation to overspend. If you're not sure how many people will attend your party, ask about or look up the store's return policy. Ideally, you'll want to be able to return any unused plates, centerpieces, invitations, or decorations. If you need to match decorations to a specific color, bring a small sample of the correct color on your shopping trip if you are stopping into a retail location. Don't rely on your memory to make the correct decision. 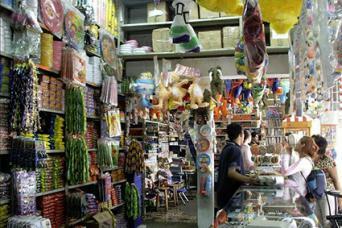 Party stores provide convenient access to a wide variety of party supplies. Instead of running all over town searching for items, visit a party supply store and take care of everything in one place. Better yet, place an online order with one of the leading stores and spend your time focusing on menu planning, house cleaning, and other activities rather than going shopping for party supplies.